Read on for more information and let me know if you have questions about these products. "I love using red double sided adhesive tape or fusible flex for when I need a super strong hold." What is Double Sided Adhesive Tape used for? 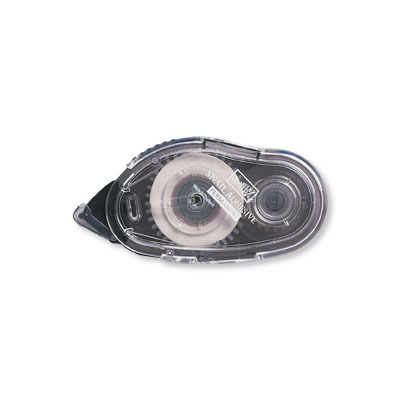 Double sided adhesive tape comes in several forms. You can find it in rolls with backing paper on it. The tape with white or off-white backing paper is usually very good for adhering layers of cardstock together and adhering photos to pages. You can also get red line tape which is a strong double sided tape that allows you to be confident that your embellishments and photos will stay where you want them to be. Red line tape is also very good to use when building paper boxes or other 3-d items that require strength at adhered seams. That is when I usually reach for it. This adhesive comes in rolls and you cut off pieces as needed. I always cut a piece and place it on my project before peeling off the protective backing as red line tape in particular becomes very difficult to handle without its backing paper. Red line tape doesn't lift, curl, distort or wrinkle over longer distances though until you stick it down and then decide you want to shift it! It is harder than other tapes to remove so be sure that you really want it to be where it is going before you press it onto your project. Stampin' Up! used to make red line tape but replaced it with Fast Fuse (see the next description below). There are some great things about red line tape. The sticky part is heat or pressure activated. 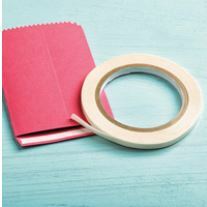 If you have trouble separating the red part from the sticky part, just press your warm finger onto the end of the strip before trying to peel up the red bit. The heat and pressure from your own finger will activate the glue and allow you to peel away the backing without any trouble. Yes, this really does work! I find a little of this tape goes a long way. Stampin' Up! always has versions of this tape so do check out the adhesives in my online store if you would like to order some. It is known as Snail Adhesive and comes in a handy dispenser. You can get refills as well. TIP: You can make this double sided tape stick more firmly by being sure to burnish it well with your bone folder after you stick two pieces of cardstock together. 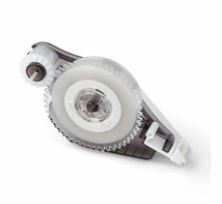 Lots of other types of double sided adhesive tape are more like a gel without that backing sheet. This can be handy when you want to use small stretches of it, or are very confident with laying a long line of it down straight. I am talking about Snail adhesive or Fast Fuse here. 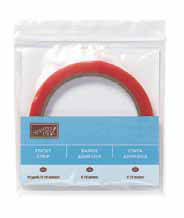 This super-strength double sided adhesive tape bonds instantly and neatly. It is safe for memory preservation projects and great for 3D projects. I learned to use it gently. There is no need to press hard with it. It can barely touch your project and glide along the space you want to use it. I use a tick motion to break the tape off when I want to finish laying a line of it down. I alternate by ticking upwards and downwards. This helps me keep the tape on its roll. 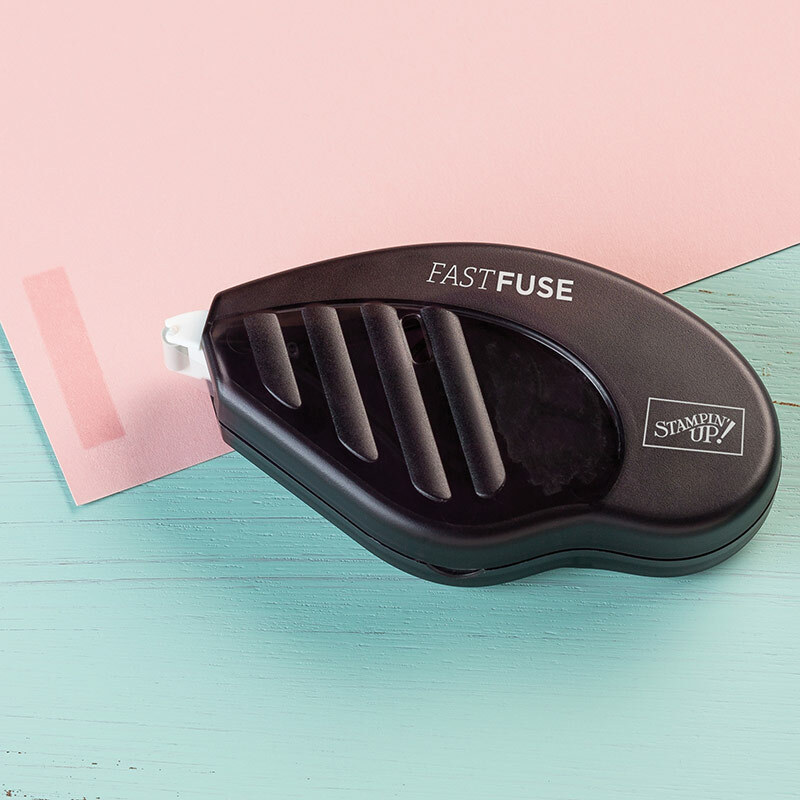 If you do lose the end of the tape, feel for the sticky with your finger and attach it to the dispenser end again with a quick slide of your finger along the dispenser's edge. Note: If you like this product, be aware that it is going to be discontinued in June 2018. Order now while you can! 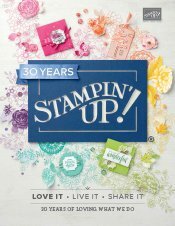 Also know that Stampin' Up! usually has other great ideas when they change a product out, including making the same product better, so watch this space!